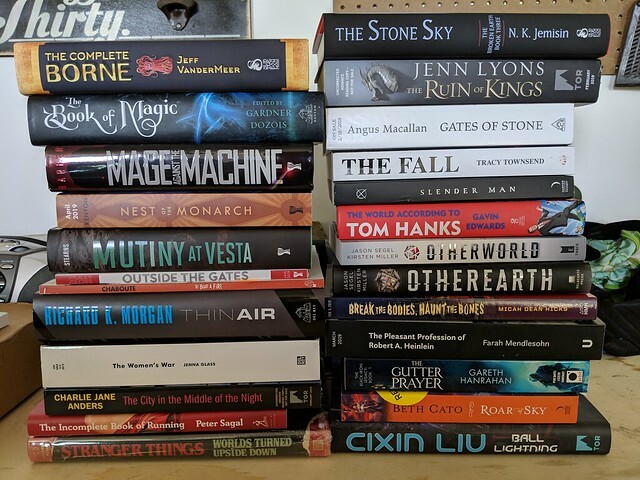 When I came home for a single day this week, I got together all the books that came to the Scalzi Compound whilst I was tour and put them together for a Super Sized double stack of new books and ARCs. Surely there is something here (more than one thing, I suspect) that you would put on your “to be read” list. Tell us what they are in the comments. And if you need a closer look at the titles, here’s a larger version of the picture. Flickr tells me I don’t have permission to view the photo. Things I know I want to read: Beth Cato’s Roar of Sky, Cixin Liu’s Ball Lightning, Jenn Lyons’ Ruin of Kings, and the Book of Magic anthology edited by Gardner Dozois. Oooh. The Book of Magic. Because The Stone Sky is just the best. It is known. Yikes mispelled that. Ball Lightning! Or.. not. It’s sold out. Sorry, folks. I’d say The Stone Sky but I already read it and it was awesome. I’d give Charlie Jane Anders a whirl. All the Birds in the Sky was pretty good. You couldn’t pay me to go near Cixin Liu again. Buy The Complete Borne just to get a short story? Not on your life and I despise it when authors pull this crap. I’ve been waiting for Beth Cato’s Roar of Sky for awhile! New Richard K Morgan! Yes, please! I read “Ball Lightning” right after it came out, same as I did with “The Consuming Fire.” Those were my two most eagerly-awaited books of this year. And they were both good books, as expected! “Thin Air” is already in my “read soon” stack. Want “Mage Against the Machine” and “The Pleasant Profession of Robert Heinlein” just for the titles. Haven’t read much Cato but what I have I’ve liked. Cixin Liu, certainly, and Beth Cato. “The Pleasant Profession of Robert A. Heinlein” is undoubtedly a riff on his short, “The Unpleasant Profession of Jonathan Haig”. Biography? Is that new book about Robert Heinlein actually published yet? Seems like we are having another Heinlein moment. There is also Astounding, which is terrific and getting great reviews in the Washington Post (whose Pulitzer Prize winning critic just said it shows why sci-fi is a serious part of literary history and reminds that Heinlein is scifi’s greatest storyteller since H.G. Wells), Christian Science Monitor, Chicago Tribune, and Wall Street Journal. There was also the latest Heinlein best novel Hugo for Beyond This Horizon which combines very of the moment Silicon Valley post-singularity concerns with the crazy libertarian/alt-right notion of a ubiquitous armed society. Largely still the pre-Ginnyformed Heinlein. Loved Arthur C. Clarke, who was gracious and visionary and engaging for hours in a small post-lecture gathering at the Lark Creek Inn on the other side of the Golden Gate. Learned a lot at a young age about how to engage a small group in fun intellectual discourse. This was a few years after 2001. Thought Asimov was fine but meh. Reading the awful forest for the trees Patterson bio does reveal that Heinlein’s generally bad health got worse and worse as he got older. Which certainly tracks not only with Wife 3.0 but also his increasingly conservative politics and decline in readability. Another book by Charlie Jane Anders? Cool! Beth Cato, though I still need to read the 2nd book in the series that comes before it. And I’m curious about Mage and the Machine. I’ll go look it up on Goodreads and see what’s up with it. Nice. I hope you’re having a marvelous time in France, John. Loved the latest book. Of the titles I can read without access to the embiggened image, well, I’ve already read the Jemisin (of course) or it would top my list. As it is, I’m most excited by the Charlie Jane Anders and the Richard K. Morgan. If nothing else, this picture should be shown to publishers and cover designers as a lesson in making the book spine legible. When I can’t read the title without squinting, I am likely to assume that the book itself is also unreadable. The Book of Magic, edited by Gardner Dozois, looks interesting.